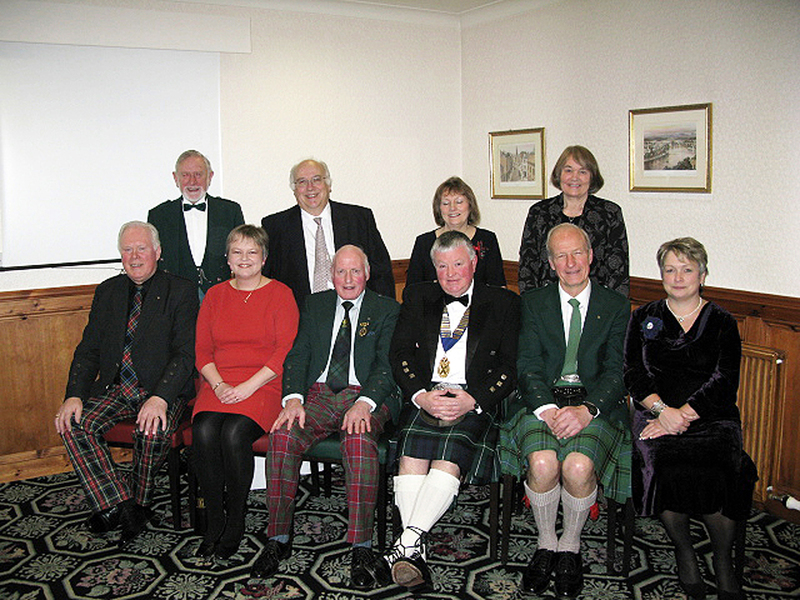 Pre Supper Top Table Guests' photograph from the Inverness Burns Club Annual Supper held on Friday 30th January 2015 at the Lochardil House Hotel attended by Hon. Presidents, Members, Guests and artistes making up a company of some 114 dedicated Burns enthusiasts. Those in the photograph are (L to R Rear) Piper Bill Hamilton, Andrew Smith husband of Fiona, Eleanor Lamont wife of President Dawson and Anna Henderson wife of David. (Front L to R) Hon. Secretary Glen Stewart, Rev. Fiona Smith (Reply frae the Lasses), Hon. President Cliff Sim (Immortal Memory), President Dawson Lamont (Chairman and Address to the Haggis), David Henderson Hon. President (Toast Tae the Lasses) and Hon. Treasurer Fiona Larg.